Sign Up to receive email newsletters and updates. 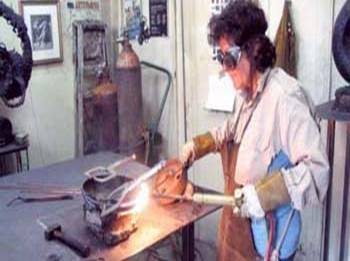 Martha Walker wields an oxy-acetylene torch with a flame so hot that it makes steel drip like wax. "It's like molten lava," she said. 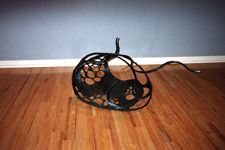 Martha Walker makes welded steel sculptures. This is a dramatic method for making sculptures, and her finished works are dramatic as well. During the Gowanus art lovers' weekend, Walker displayed several of the pieces at her studio at 168 7th St., which has been her workplace for the past decade. Martha Walker is a micro biology­-minded Surrealist whose recent show, "Broken World, Anxious Hea rt,” imagined a toxic garden. Long ago, its seems, life rose from luxuriant waters, briefly inhaled the air's sweetness, then froze. Denizens of this now-petrified forest of twisted steel skeletons include femi ni ne breeds undulati ng thei r potent animas and biomorphic forms caught between joie de vivre and a danse macabre. Formally elegant species defy weighty steel, and negative arabesques assert themselves within masses of dense metal. It's all best described as lyrical gravitas. Martha Walker — whose morbid Tim Burton-esque sculptures have appeared in episodes of “Gossip Girl” — will “explore personal demons” through her molten steel and copper statues at 111 Front Street Galleries. Park Slope artist Martha Walker's work is poised to get its very own 15 minutes of fame. 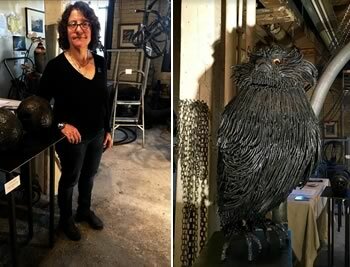 Her metal sculptures, made out of meticulously dripped molten steel, are starring in an upcoming movie as the work of an artist played by Olympia Dukakis. Her pieces feel amorphous, like living creatures dragged up from the bottom of the ocean or landed from earlier eons on earth. They start out looking heavy (which they are), but become lighter the longer that one ponders them. 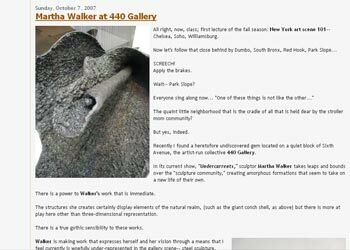 And from the strength of Walker’s originality and execution through to her adamant way with promotion, it seems that she’s now having her own moment of fame, with a growing number of gallery shows up and down the East Coast drawing her attention. Park Slope artist Martha Walker's work is poised to get its very own 15 minutes of fame. 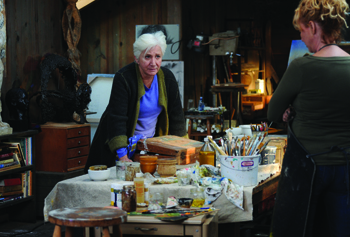 Her metal sculptures, made out of meticulously dripped molten steel, are starring in an upcoming movie as the work of an artist played by Olympia Dukakis. About seven of her pieces will dress up the set of "The Art of Love," a teen fantasy romance about three generations of women artists with secret magical powers, expected to hit theaters next fall. Art can be anything. 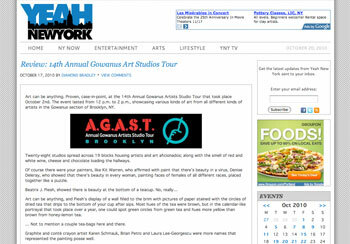 Proven, case-in-point, at the 14th Annual Gowanus Artists Studio Tour that took place October 2nd. The event lasted from 12 p.m. to 2 p.m., showcasing various kinds of art from all different kinds of artists in the Gowanus section of Brooklyn, NY. 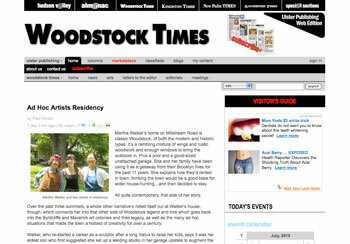 Martha Walker’s home on Millstream Road is classic Woodstock, of both the modern and historic types. It’s a rambling mixture of wings and rustic woodwork and enough windows to bring the outdoors in. Plus a pool and a good-sized unattached garage. She and her family have been using it as a getaway from their Brooklyn lives for the past 11 years. She explains how they’d rented in town, thinking the town would be a good base for wider house-hunting…and then decided to stay. 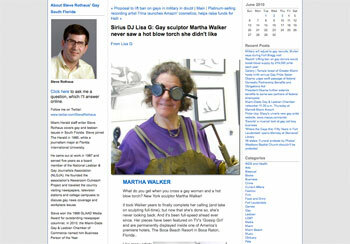 Martha Walker is a sculptor based in Brooklyn, NY, but like many residents of Gotham she has a connection to South Florida. The artist went to Miami Beach High School, and graduated from there in 1971. What do you get when you cross a gay woman and a hot blow torch? 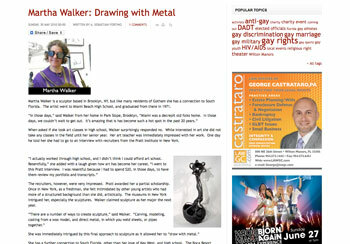 New York sculptor Martha Walker! "A Parallel Presence: National Association of Women Artists, 1889-2009,"
Martha Walker is a Brooklyn, New York sculptor who uses molten metal to create forms that seem to float through space. These pieces range in scale from 12 inches across to 10 feet high. Due to their fluid nature, the inorganic origins of Walker's pieces are unrecognizable, and often, they are likened to aquatic or microbiological organisms. Walker believes that her painstaking, meditative process reveals subconscious imagery and gives her art a feeling of timelessness. As clouds gathered and rain scattered and pelted the ocean, Martha Walker was stirred by the moment. 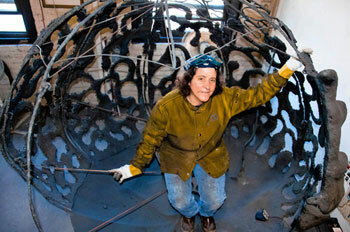 The 55-year-old New York City sculptor thought she might be able to conceptualize the images in steel. But what started as a rain-induced inspiration quickly turned more somber. 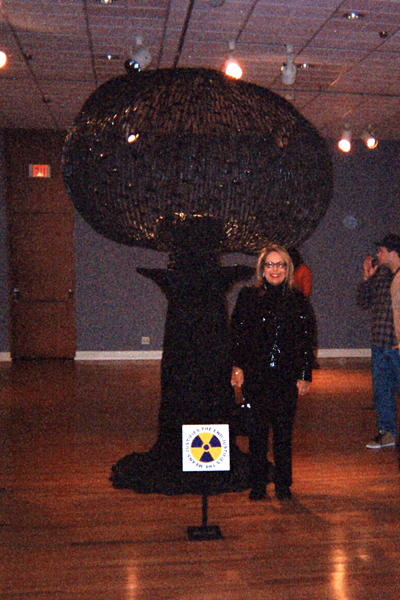 As she welded and shaped molten metal, she embraced a more political view, and an atomic mushroom cloud rose, volcano-like from the center of her piece. "The End Justifies The Means, Justifies The End," standing almost 10-feet high, is the centerpiece of "Expanding Universe," an 11-sculpture exhibit by Walker which opened this week in the Dana Gallery of The Phillips Museum of Art located in the Steinman College Center at Franklin & Marshall College in Lancaster. 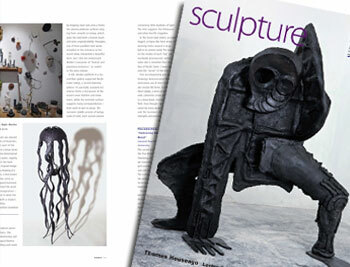 Sculptor Martha Walker looks for the beauty of nature, sees allusions of anguish and disaster and molds them into steel. An exhibit of the sculptors welded-steel structures, Expanding Universe, opens Jan. 20 at the Dana Gallery in The Phillips Museum of Art. It runs through March 29. 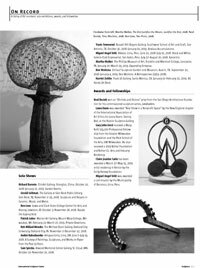 There will be a gallery talk and artist's reception on March 6, at 4:30 p.m. in the Dana Gallery. Walker's sculptures have been shown in numerous exhibitions and featured in the windows of Saks Fifth Avenue in New York City. 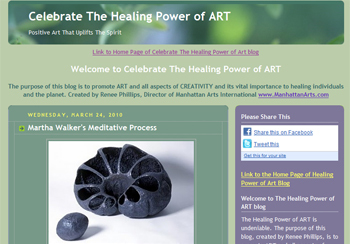 "I can't say what triggers the images completely," Walker recently told Manhattan Arts International. "They seem to come from a dream consciousness. They are often in muted colors, or grays and muted blues, which is how I dream. I also think there is a subconscious psycho-sexual connotation to a lot of my images." 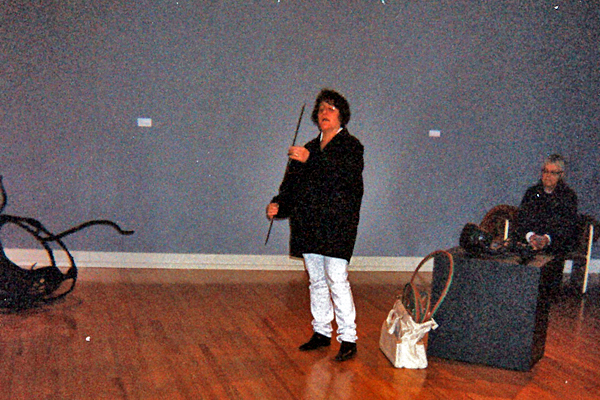 Her work is in many collections, including the Jane Vorhees Zimmerli Art Museum and the Ann Frank Center in New York. 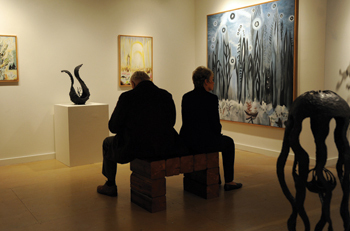 The exhibition and gallery events are free and open to the public. 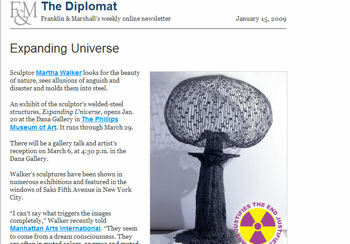 In agreement is Martha Walker (www.marthawalker.net) a sculptor from Brooklyn, New York, whose work is in many collections, including the Zimmerli Art Museum. Two of her sculptures were recently installed at the Kouros Sculpture Center, and her sculpture, Hope, was purchased and donated to the Anne Frank Center. She will have a solo exhibition at the Phillips Museum of Art, Lancaster, Pennsylvania, January 20 through March 29, 2009. 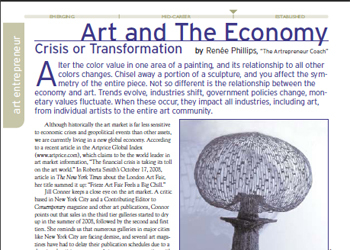 She says, "In uncertain times, it makes sense to diversify assets away from paper investments, like stocks and derivatives, putting a larger portion into physical investments like metals and collectibles (artwork). These assets tend to increase in value in both good and bad economic times, and more so should we experience inflationary trends. Certainly, purchasing the work of emerging artists offers the greatest potential for reward, although ultimately the fundamental reason for buying art should be because it is something that the buyer truly enjoys owning. There is nothing wrong with reminding buyers of this when discussing one's artwork, because all of the others selling their products are using similar strategies." 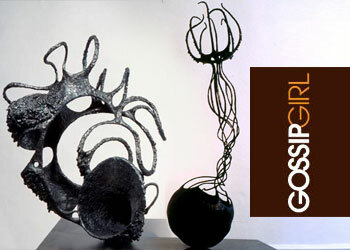 GossipGirlReport.com features Martha Walker after her sculptures, Hope and T'Kiyyah, Sound of the Shofar, appear on the show. 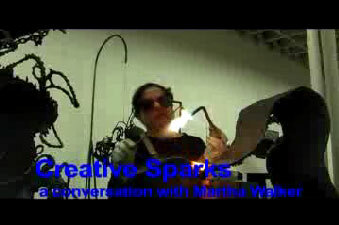 Here is a clip of Martha Walker's sculpture on the popular T.V. show, Gossip Girl, that airs on Wednesday, January 9th, 2008 at 9:00 p.m./8:00 p.m. central time. 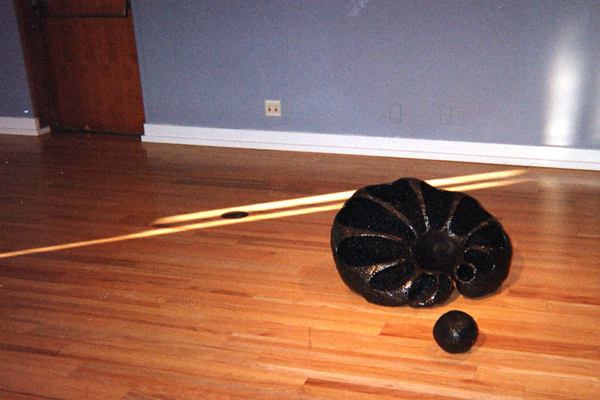 Two of her sculptures, Hope and T'Kiyyah, Sound of the Shofar were chosen by the art director as props for a scene in a trendy New York City art gallery. 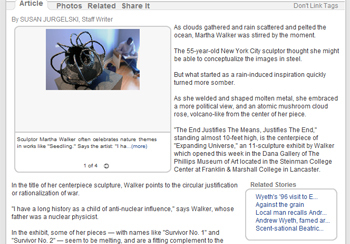 Don't miss Martha Walker's sculpture on the popular T.V. show, Gossip Girl in this upcoming episode airing on Wednesday, January 9th, 2008 at 9:00 p.m./8:00 p.m. central time. Two of her sculptures, Hope and T'Kiyyah, Sound of the Shofar were chosen by the art director as props for a scene in a trendy New York City art gallery. We are proud to present two outstanding artists, Bonnie Leibowitz and Martha Walker, as the Manhattan Arts International Featured Artists of the Week, from October 16-22. Martha Walker is achieving the recognition she deserves. After two years spent toiling with a welder’s torch, Martha Walker exhibits her latest steel sculpture, “Undercurrents,” on display at the 440 Gallery in Brooklyn, September 6-October 14 with an opening reception September 7 from 6-9 p.m. Through her work she reflects her love for science and her goal to convey a message that is personal. 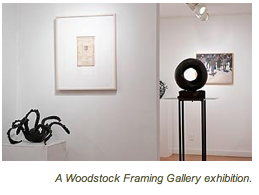 "Recently I found a heretofore undiscovered gem located on a quiet block of Sixth Avenue, the artist-run collective 440 Gallery. In its current show, "Undercurrents," sculptor Martha Walker takes leaps and bounds over the "sculpture community," creating amorphous formations that seem to take on a new life of their own. There is a power to Walker's work that is immediate." There is no doubt that Martha Walker's childhood was anything short of incredible. Her parent's love to travel lead to Martha living all over America, from Miami Beach, FL to Kansas City, MO to the west coast, and she even spent three years living in a remote forest in Sweden. If this wasn't an exotic-enough upbringing, the artists' father worked as a nuclear physicist through the height of the arms race (to which he was opposed). Martha Walker often visited her father's laboratory and was exposed to microscopic images, which have reverberated in her art. 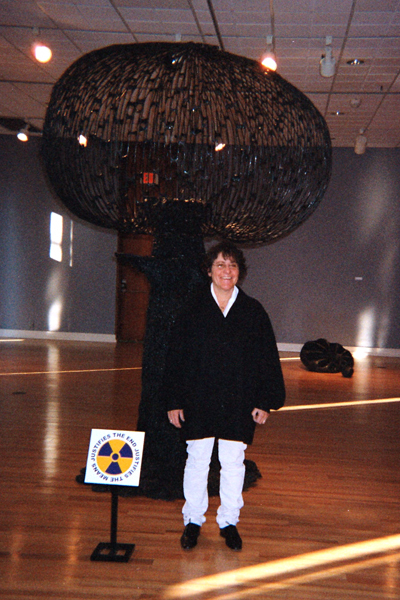 Walker is a sculptor, with some of her works reaching up to seven feet tall. 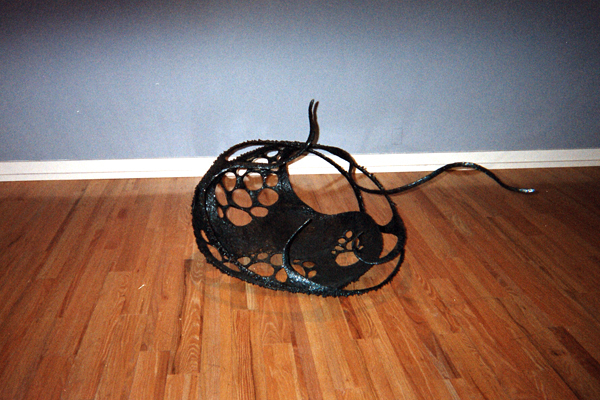 With her background, it's no wonder Martha Walker's work takes on such unique, organic forms. MG: What attracted you to sculpture as a medium? MW: I have always had an affinity for 3-D, ever since I was a child. I used to make cartoon figures out of clay and display them on my desk: Pirates fighting with swords made of sewing needles. 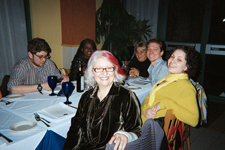 When I went to college (at Pratt Institute), my primary focus was drawing. As a freshman, I took an Introduction to Welding class, and I was immediately struck by the way metal could bend to form a 3-dimensional line in space. For me, it was 3-D drawing. I also saw exhibits of sculpture at that time that totally inspired me, including Degas sculpture, Matisse, and Rodin. 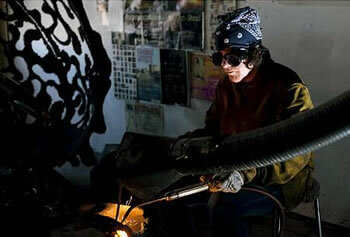 MG: Do you have an image of what you are going to sculpt before you begin welding? MW: I have a vague idea in mind before I start, but it often changes dramatically as I proceed. Sometimes it changes less dramatically, but it always takes on a life of its own, and evolves. MG: How do you decide what your next project will be? MW: At this point, I have about three sculptures in my head that I keep imagining. My process is slow, so it allows me to work on one, while developing at least one more while I'm working. I have no shortage of ideas at this point. MG: How long does it take you to finish a sculpture? What is the longest one has ever taken you? MW: The longest that a sculpture took to complete was Pacific Crater, which took over 2 years. But, that was because I was at an early stage in my artistic development, and I really didn't know where the piece was going. I made major changes along the way. The time to complete a piece is often influenced by the size of the work. T'Kiyyah, Sound of the Shofar only took a few months. Birth and Hope each took about six months to finish. MG: How many hours do you spend in the studio weekly? MW: 20 to 30 hours. I wish I could spend even more time, but I have familial and business obligations. MG: In your mind how does an image from every day life transform into one of the more abstract images we see in your sculpture? MW: I don't think about images from everyday life. The viewer often comments that my work reminds them of something from life, but my images come from a subconscious, dream level. They just pop out at me. MG: What do you do when ideas pop into your head? What do you think triggers these images? MW: Sometimes I sketch out what comes into my head, but more often, I work over the image in my mind for a long time, sometimes making changes, and sometimes just sort of savoring it. I can't say what triggers the images completely. They seem to come from a dream consciousness. They are often in muted colors, or greys and muted blues, which is how I dream. I also think there is a subconscious psycho-sexual connotation to a lot of my images. MG: I see listed on the website that you list the puddling process as part of your work. I was hoping you could explain more about what that is: is it a process you do yourself or is it a way of treating steel before you sculpt it? How does it affect your art? MW: "Puddling" means to build up form by dripping the steel as if it were wax. I use rods to create lines and guide my dripping process, but all of the masses that you see are built up through dripping the steel. This slow process allows for greater reflection, instead of "rushing to judgment", and the method causes the steel to appear much softer and organic. The metal flows like lava. I believe that all art should integrate process into the result, and that this method epitomizes this idea. MG: How do you manage larger works such as "Birth" – A 7 foot tall piece? Do you make it in multiple pieces? MW: Yes. "Birth" was the result of making the top form, then the large bottom form. I suspended the upper form, and placed it at the desired angle, and then connected the two. MG: Of the many places you lived growing up, which was your favorite? Why? Which has impacted you most? MW: I would have to say that Sweden was my favorite, and impacted most on me as an artist, because for a period of time, we lived in a very remote forest area, and I connected with nature in a big way. Natural forms, both microscopic and aquatic play a big part in my images it seems. MG: How has living in New York City influenced your artwork? MW: New York City is my favorite place in the world. The city is teeming with art and artists, and that has been the greatest influence. It raises the bar when so many people are so serious about their work, and so talented. MG: Do you visit galleries or museums in New York? Is there any art you've seen recently that you've particularly enjoyed? MW: I try to allocate a day every month to visiting galleries or museums. I've just returned from Europe, and the Rodin Museum was the highlight. I find that classic work is something I feel very comfortable with. Even though my work is abstract, I feel like I operate with classical composition as a basis for what I make. MG: In your bio you talk about your father's work in the laboratory and your exposure to the world of science. Where can we see this reflected in your work? MW: The microscopic connection. I used to spend a lot of time viewing microorganisms under the microscope. I loved their bizarre forms. MG: Could you give an example of a piece of your work that was strongly influenced by the time you spent in the laboratory with your father? MW: Birth is an example of something that may have been influenced by observations of microorganisms. The piece actually started with the idea of cell division. Another is Aphrodite. It seems to me to have a head, a thorax and an abdomen, and it also has a weightless quality, as if it may be floating in plasma. MG: When I saw "Pacific Crater" I was instantly reminded of a trip I took to a beach in California - it is a large steel sculpture remnant of a cove that might sit off the coast of a Pacific beach. What inspired this piece? MW: A trip to Hawaii in 2001. I actually took the basic form from watching the Hawaiians weave shallow baskets from palm fronds, and then there was the lava from the volcanoes that I am so fascinated by. MG: Is there anything you're working on now that you are particularly excited about? MW: I'm working on another large piece; I think it will be around the same size as "Birth", which is seven feet. It's very different. Sort of wild, and it is very challenging to make, because I'm working from the top down. That means that this huge, heavy mass is suspended in space until I reach the bottom. MG: Was there a time in your life when you considered pursing a different profession than art? If so, what was the other profession? What made you decide to pursue art instead? 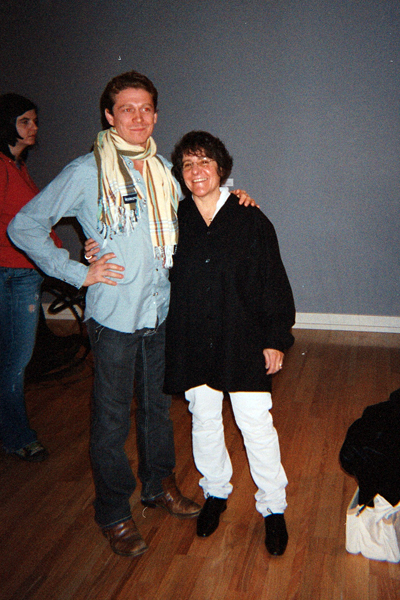 MW: I did pursue another profession until 2001 when I went back for my graduate degree at Pratt. Most of my life, I was in various sales positions. I owned my own marketing company for 15 years. I was also a commodities broker and a stockbroker. My attitude was that I would rather follow a commercial business career to make a living than to compromise my artistic values. I waited until I was financially comfortable so that I could make art without worrying about "the sale".